So, you’re considering buying or you’ve already got yourself a table tennis table and you’re looking for tips on making the most of your purchase. While you can just pick up the paddles and hit the ball back and forth with a friend, we think you’ll have more fun if you know what you’re doing. You can even get good enough that you can play in tournaments or at least compete at the local bar. Regardless of what types of beginner tips you’re looking for, our intro to table tennis below can help get you up to speed. Ping Ping vs Table Tennis – Is there a difference? You might be wondering if there is really any difference between playing table tennis and playing ping pong. There is no real difference. In fact, you can use the two terms interchangeably. Historically, the term “ping pong” was used mostly in the USA as a result of Parker Bros. owning the trademarked the term from 1901. As a result, “table tennis” was used in the rest of the world. Ping pong can be played as a singles game or a doubles game, but the objective is always the same. The first person or team to earn 11 points wins the matches. And there is always an odd number of matches played so that one side can reach that point level. As you play the game, you earn a point when your opponent cannot return the serve over the net to you. You win when you reach 11 points, but you have to be leading by at least 2 points. If you’re not leading by 2 points, then the winner is the first to lead by 2 points. Typically, a match is played as the best of five or seven games. So, in a five game match, the winner is the first to take three games. 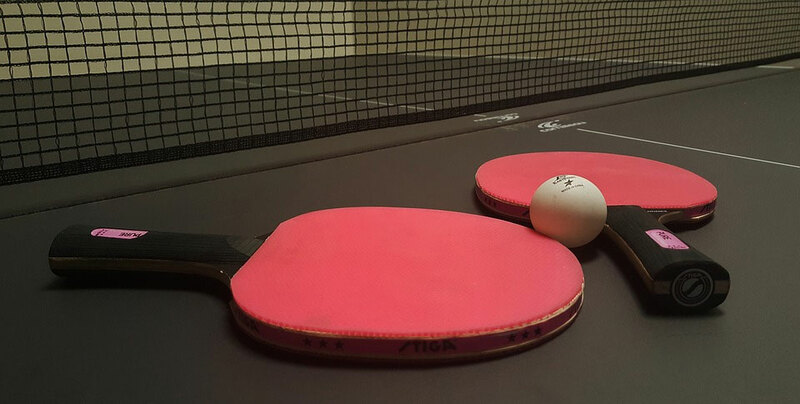 Before you play your first game, take a moment to learn the rules of table tennis. This ensures a fair game for everyone who plays with you. You can’t change your racket during a match unless it gets damaged to the point that it can’t be used. The net must be 15.25cm above the playing surface. You cannot place your free hand on the playing surface when the table tennis ball is in play. You cannot move the table during game play. You can jump or sit on the table during game play, as long as it does not move and you do not touch it with your free hand. Once the ball bounces a second time, the ball is not considered in play. The penalty for moving the table or touching it with your free hand while the ball is in play is the automatic loss of the point. The ball must always remain visible during the serve. The ball must be on the way down when serving (you can’t hit it as it is still rising in the air). If the ball hits the net and then goes over on a serve, called a “let serve,” and it’s a fault. But if it doesn’t go over and touch the receiver’s side, then the receiver gets a point. If the server misses the ball when making a serve, then the receiver gets the point. To help you make better sense of some of the terminology you see, we’ve come up with a glossary of the most common table tennis terms. Check it out below. Backhand: A stroke played across the front of the body when the back of the hand faces forward. Backspin: Used in defensive shots, it involves chopping down on the ball and moving the bottom of the ball away from you. Bat: Another name for the paddle or racket/racquet. Block: A defensive play in the game that is used to combat loops and smashes in order to keep the ping-pong ball on the table. Chop: A defensive stroke that returns a topspin that is played with backspin. Chopper: A style of play when a player primarily chops the ball. Closed: When a player strikes the top of the ball with a specific angle of the racquet. Double bounce: When a ball bounces twice on one side of the table without a return, the player loses a point. Doubles: Playing a game of teams of two. Drop Shot: Hitting the ball so it just passes the net and the other player has a hard time responding. Drive: Taking a shot offensively in a rally where the ball is hit back and forth at a medium pace. Fault: A failure of the server to make a good serve. Inverted: A rubber type on the racquet that has a smooth finish but grips well; it can generate a large amount of spin and is also known as pips-in. Let: A rally when the result is not scored. Lob: A defensive shot in the game is usually performed against high-speed shots and results in the ball being returned high in the air. Long pips: This refers to racquet rubber with a surface of long pimples, which can result in an unpredictable spin. Loop: An offensive shot with topspin. Match: A game of ping pong where the winner is the person who gets the best of five or seven games. Open: This refers to the angle of the racquet when the bottom of the ball is hit. Short: A type of serve that bounces twice on the opponent’s side of the table, or would potentially do so, and is difficult for the opponent to return. Spin: A move when the ball rotates on an axis during flight. This occurs when the rubber surface of the racquet or bat grips the ball. Topspin: A spin that causes the ball to bounce low and fast on the opponent’s side of the table. Twiddle: A technique that involves a player turning the bat in his hand during the rally so use both surfaces of the racquet on the ball.